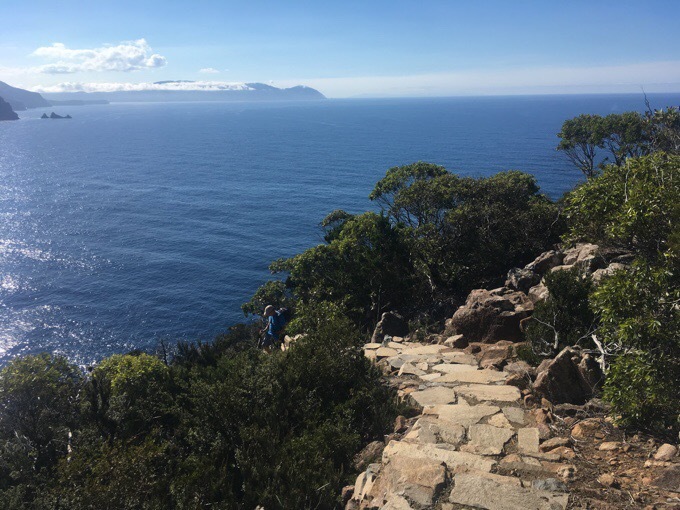 As I mentioned yesterday, we are doing a portion of the Three Capes Track along Tasmania’s east coast. It’s been around for awhile, but just over a year ago, they opened it up to include a start with boat tour in the ocean, plenty of nice boardwalk along the track, and nice huts in scenic locations. 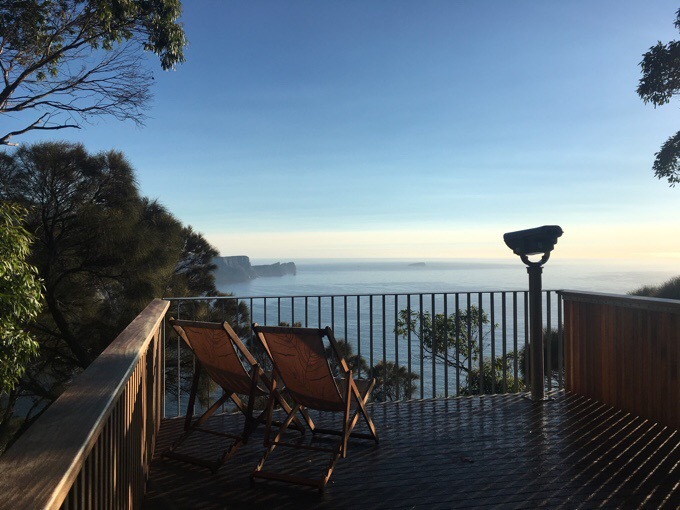 It seems to be limited to about 50 people a day who pay $500AUD/$400US for the three night/four day hike. 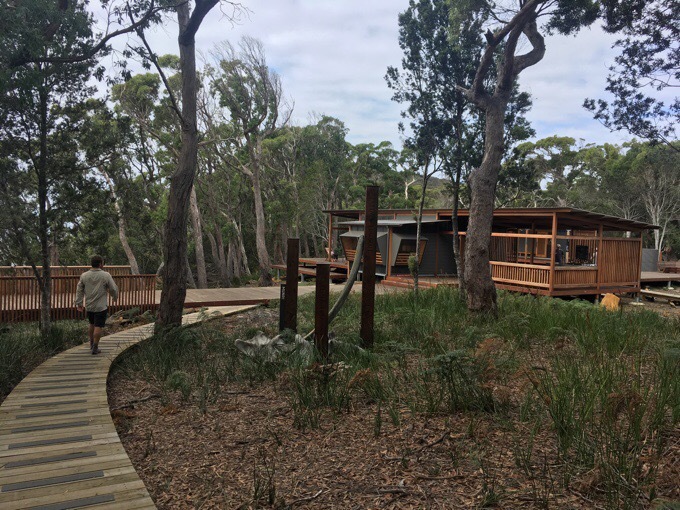 Many call it glamping because of how nice the huts are and how much of the hike is on boardwalk. Walkers do need to carry their own sleeping bag and food, but stoves, pots, and sleeping mats are provided at the huts. There is a way to do 2/3 of the walk for free with one free campsite off the route that we stayed at last night. Many do this as a two night trip, but we knew we could do the bulk of it today and chose to do a bigger day today rather than two shorter days. 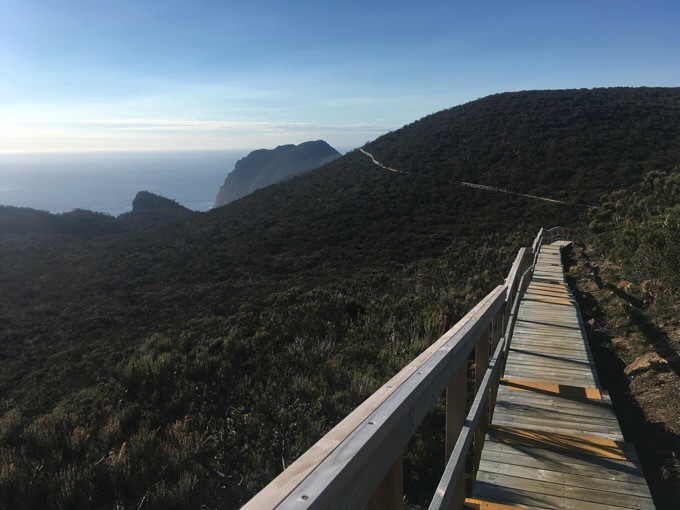 It started off with some relaxed boardwalk walking towards Cape Pillar and Munro Hut. The hut was brand new and in a beautiful setting. It felt more like a resort there with nice relaxing chairs, grand views, and beautiful architecture. 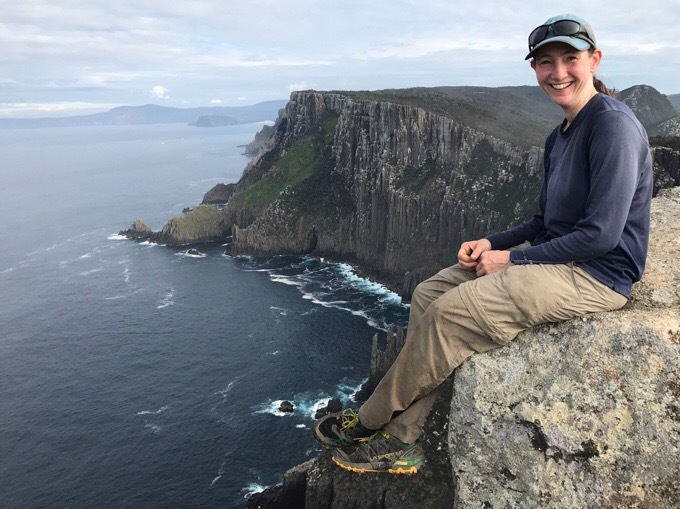 As we arrived, about an hour into our day, people were just beginning to leave the hut for their day’s walk out to Cape Pillar and back before moving on to their next hut for the night. 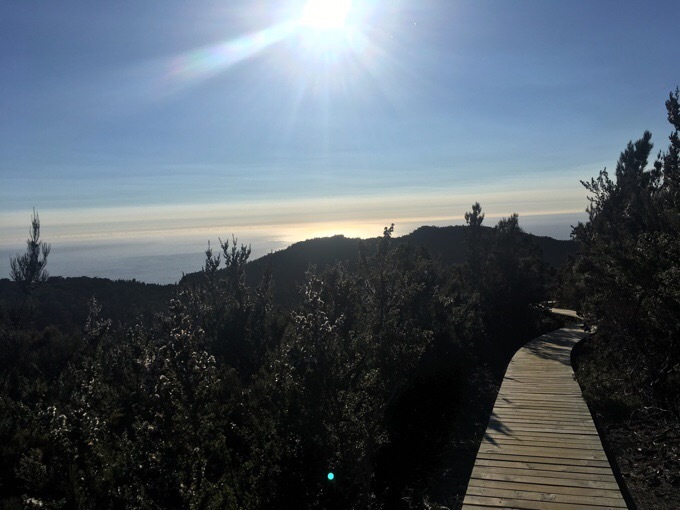 View from Munro Hut towards Cape Hauy. 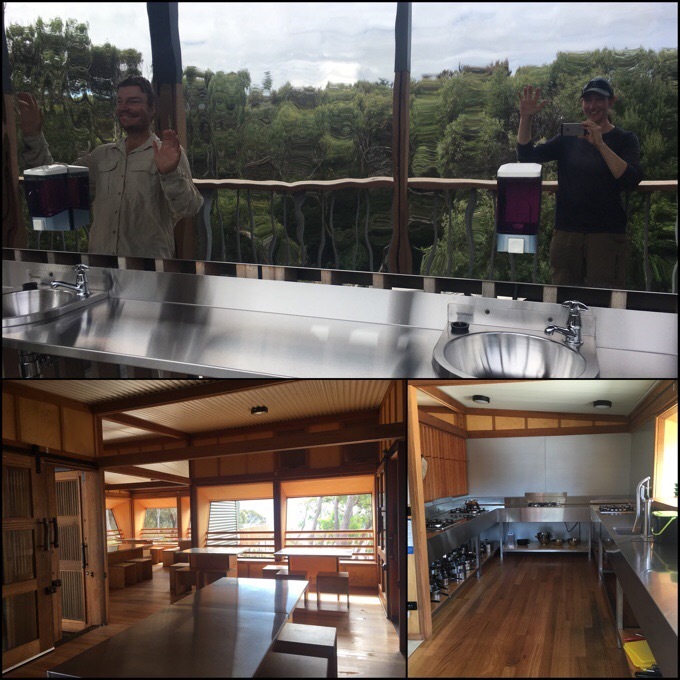 The new and pristine hut with bathrooms with sinks and nice soap! The ranger there was super welcoming even though we didn’t have an official Three Capes Pass. 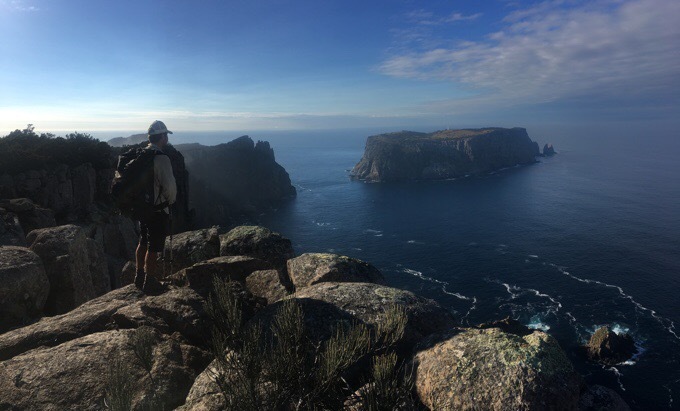 People are welcomed to do the track for free, but we were surprised when he offered us use of the water tap and told us we could even store our packs in the shed with all the others while we did the 14km/8.7mi return trip out to Cape Pillar and back. We chose to keep our stuff with us since they didn’t have much in them anyway, but it was quite welcoming. 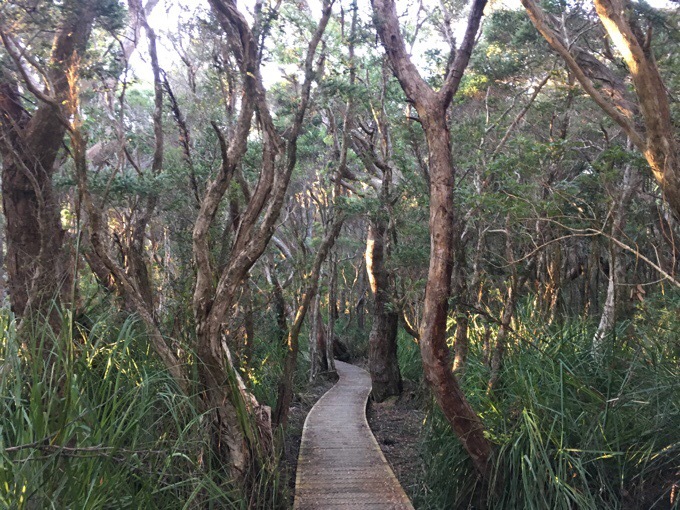 The walk out to Cape Pillar had nice boardwalk for much of it, and the light was great with the morning sun shining off the ocean. 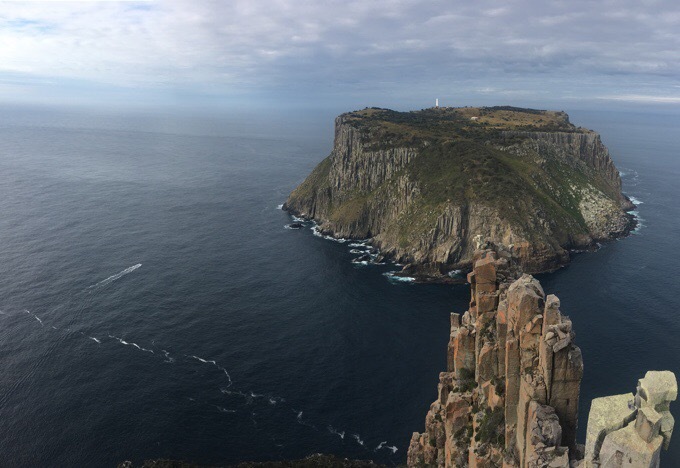 As we got to Cape Pillar, we were able to see the side view of where we’d be headed and saw Tasman Island not far off the coast with quite the impressive scene. 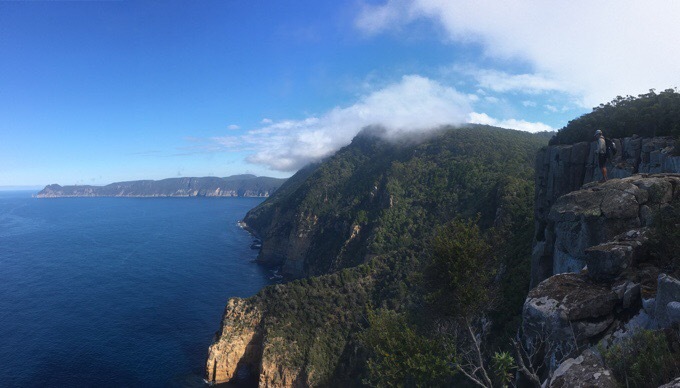 Tasman Island from Cape Pillar. 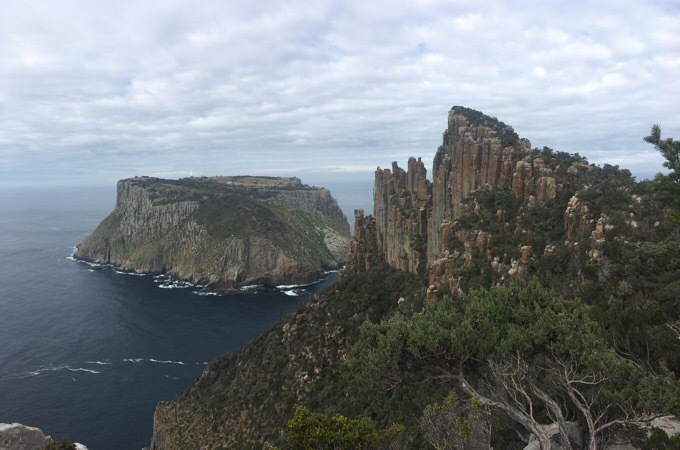 The final part of the hike goes up The Blade to great views of Tasman Island and the coastline with cliffs. Pretty amazing views. We were happy to be up there with the first few people this morning just ahead of the crowd. Really, just a very impressive view and cliffs that you could stare right over that made me dizzy we were so high up. Two of the women up there told us how they were up there almost exactly a year ago when lightning struck the rock and went through them. One had it enter her hand and go out her leg. It was emotional for them to be up there again on the anniversary of such an intense shared experience. 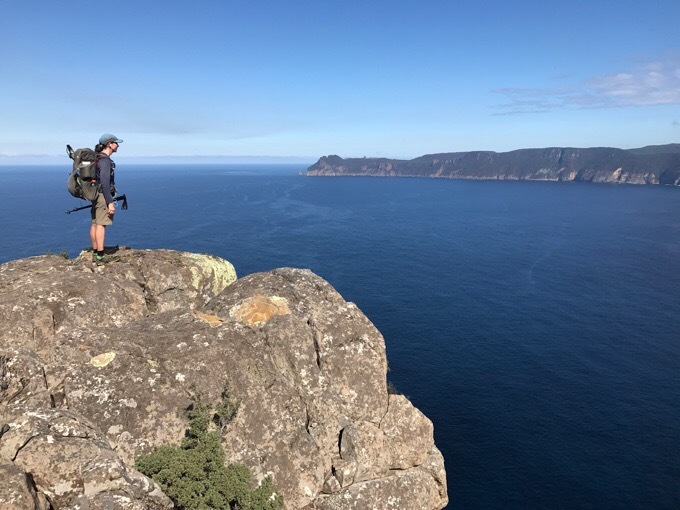 The Blade that we will hike up and Tasman Island. Atop The Blade looking back along the cliffs. 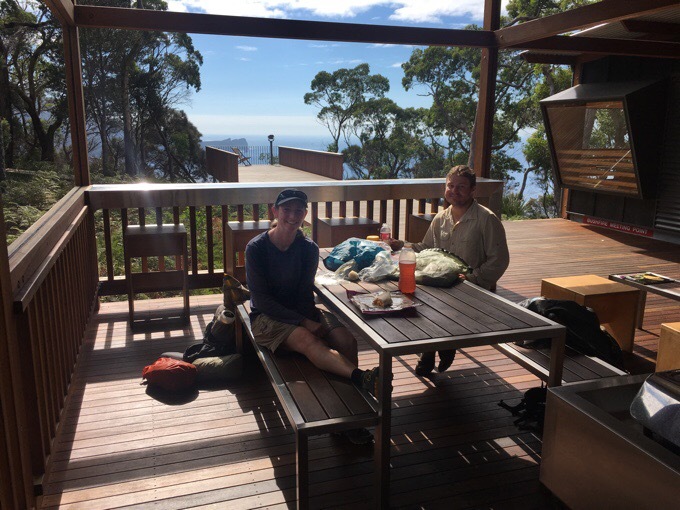 After doing the return hike to Munro Hut, we ate lunch there and the ranger chatted with us since everyone else was still out at the cape and it was still too early for the next group of 50 walkers coming in today. He told us that it’s filled to capacity almost every night in the summer and it’s open all year. He said that there’s been a movement with the current political leaders to allow more of the commercial companies to construct in the parks. This winter, even nicer huts will be built along this route for true glamping. It will include fully catered meals and even nicer huts that are probably more like lodges. He said nearby, one of the new private ones will have a pool up on top of a cliff. 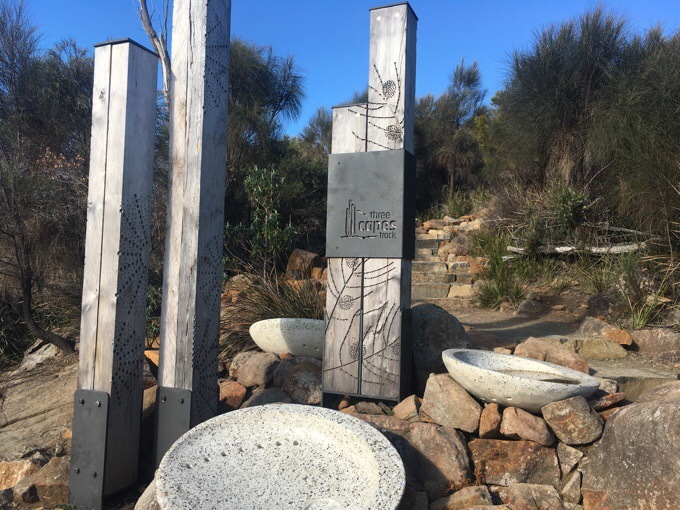 He said it will be for private guided walkers and that will cost up to $3,000AUD/person. 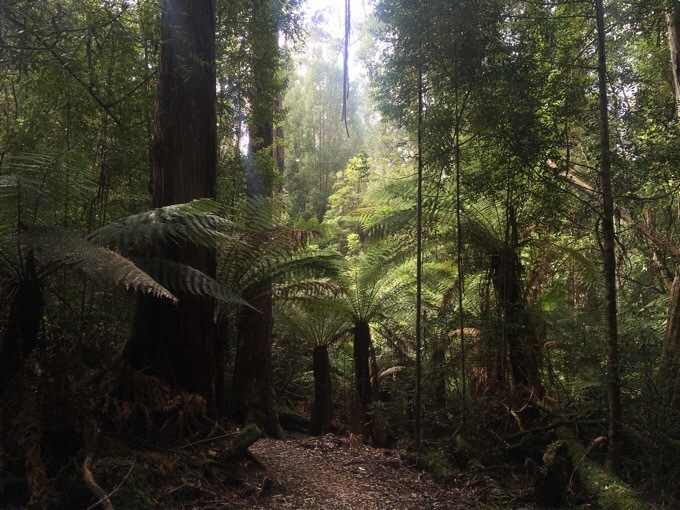 Pretty incredible, and similar to what we saw on some of the Great Walks in NZ. I personally am happy people are getting out regardless of how they like to do it. There seems to be plenty of space, and there’s still the free option for people who like to do it that way. It’s nice that they are able to accommodate all preferences, and it brings good money in through tourism. We did have a couple odd and uncomfortable interactions with some today who expressed their feeling of entitlement more outwardly, which felt out of place in nature, but overall, everyone was really welcoming and sociable. 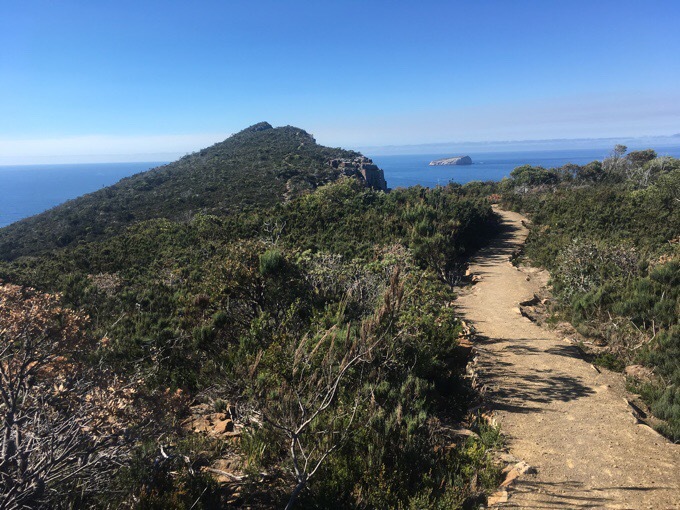 After lunch, we walked by the next hut and on to Cape Hauy. 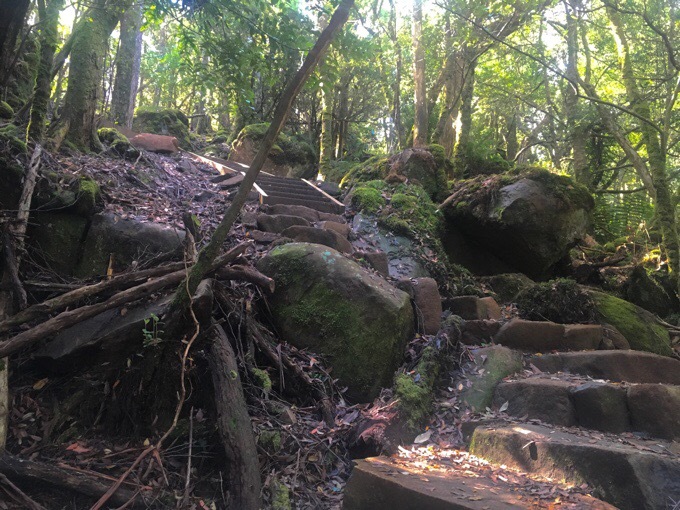 The track was more like a tropical rainforest and had more elevation change, so it was surprisingly more of a workout than I expected. The scenery was unique though. One note to mention. There were random things along the trail that sometimes seemed like art, and at other times just seemed random. We wished at the end that we had photographed all of them because it was the combo that made it so odd in a way. One example was at the end of the boardwalk to Cape Pillar, there was a sentence covering four board lengths that said in big red letters engraved in the boards, “My blood runs cold.” I found out later that there’s a booklet that comes along with the paid hike that explains all these and gives some background on the track and the area. The blood quote is apparently in reference to snakes in the area. Here are a few photos I did take. 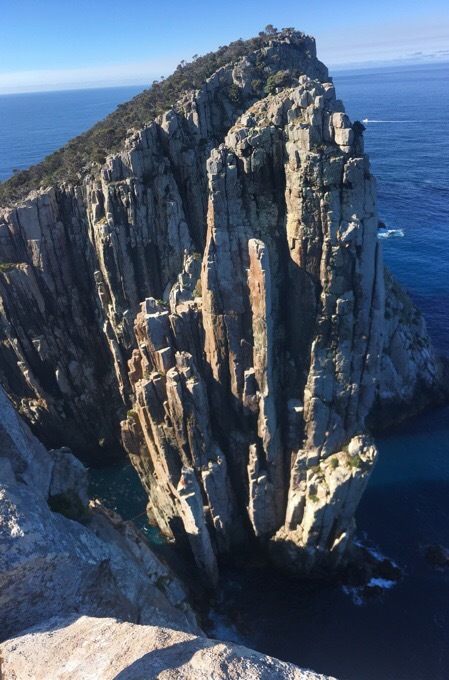 Once closer to Cape Hauy, there were great viewpoints from the cliffs that looked back on Cape Pillar. Cape Hauy had many rock steps that went down and then back up a couple times. Heading out to Cape Hauy. The view at the tip was more than the camera could capture. The tall rock spires were very impressive and are called The Totem Pole and The Candlestick. It was a straight drop down the cliff and was intense to look down from. There was a viewpoint with a railing, and an option to go down a bit further, which we did. There were people somehow climbing The Candlestick and we saw one at the top of The Totem Pole with a rope that went across to just below us like a tightrope. Many watched and waited to see what they were going to do, but it seemed it was going to be a long while before anything would happen. It was crazy to think people climbed that stuff! Notice the climber and rope atop The Candlestick bottom left. After Cape Hauy, it wasn’t much more of a hike back to the parking lot, and we were done by 5pm. 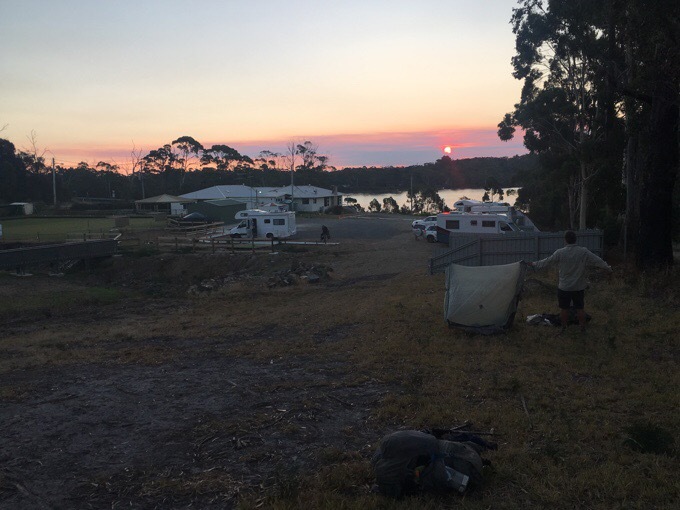 We drove a bit closer to our next destination of Cape Raoul tomorrow, had dinner at a takeaway, and are camped in a small town called Nubeena where they allow camper vans and tents. Whew, what a nice day! Ending monument for The Threes Capes Hike. 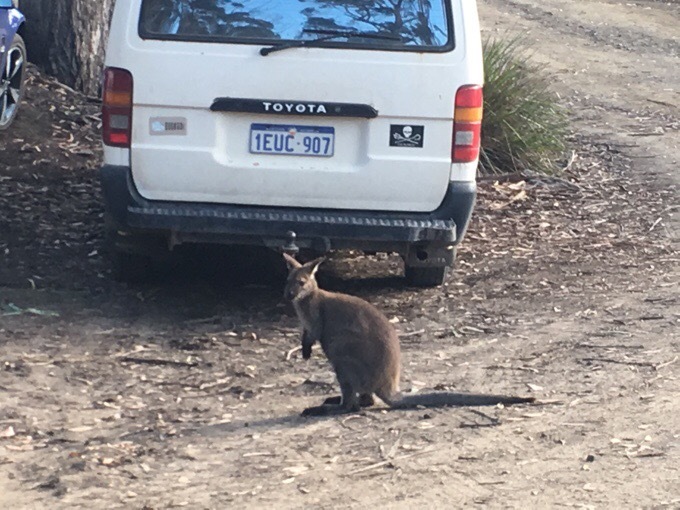 Our one animal sighting (other than tons of lizards) was a wallaby in the parking lot of course. Quite the sunset as we setup our tents. Erin, you really impress me. You sitting on that rock cliff. Not sure I remember you ever doing that before. Looks like a pretty awesome day despite the few oddities. Those cliff edges were freaky! Wow…what an incredibly “perfect” day! Amazing views. Your weather was a little better than the weather on my hike today! I feel that you’re in some sort of alternate universe with fleece jackets, rented cars and 5-star huts! ? Kathryn and I went to the banff film fest last week and saw a film about a guy who had a climbing accident on the totem pole. Lost one side of his body strength. Years later his friend brought him back and he Clemente moved it successfully. Very emotional stuff. Oh wow, I’ll have to check that out. It was crazy to look at. You sure got perfect weather. 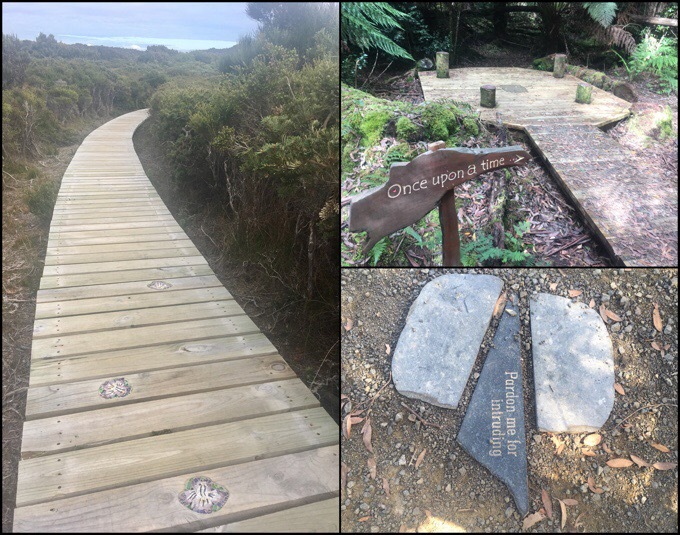 I’ve read about this track in aussie hiking magazines, it looks fantastic! It’s raining inland. Great that in Tassie, there is a dry side and we can jump around to the dry spots with the car. We definitely aren’t. thru hiking anymore! It seems like everything came together to make for a spectacular day. And those glampers will hopefully support more funding for all who want to be outside.. Great unless it gets to private ownership of the great places. Long ago Oprah did an interview with Donald Trump (I wonder if this footage has been destroyed) and she told him she was buying all the coastal property she could get in Hawai’i, because there was only so much available. Trump approved of that. So I hope we can retain access for a range of people. I would be sitting with my legs hanging over the edge, wondering if I would get up again! I agree, as long as they still allow us simple folk the option of good old fashioned backpacking without having to pay for hotels/resorts in order to visit these places, I’m all for it.